When you become a mom for the first time, the experience can be an emotional roller coaster: exhilarating, overwhelming, lonely, rewarding–sometimes all at the same time. It’s important to arm yourself with a support system that will give you what you need and also put everything into perspective. These are the five friends I believe every new mom needs to survive. She listens to what you are going through without any judgment. Whether it’s the struggle to balance your work/home life, or your baby’s adorable first sounds, she is there for you. She understands your troubles, and applauds your achievements. She may have done things differently herself, or may express an alternative point of view, but she wants to hear you loud and clear without projecting her own feelings onto you. She is a gift. 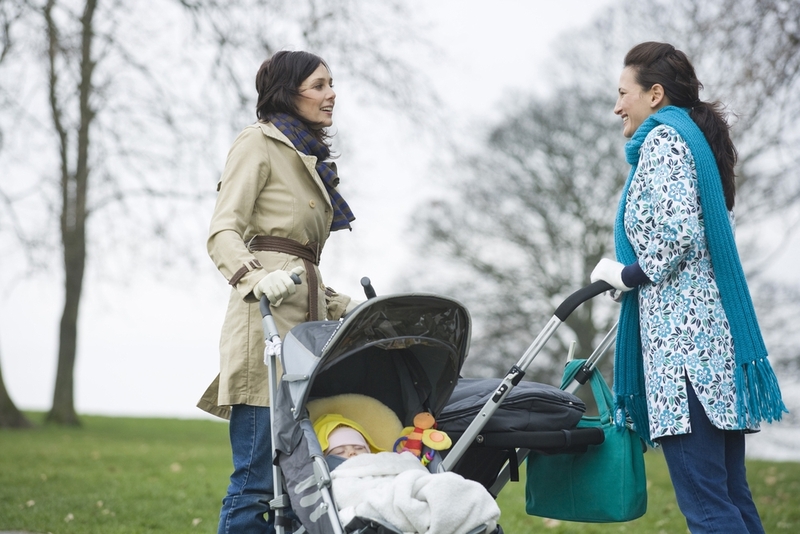 READ: Is Making Friends Easier When You’re a Mom? My Good Listener didn’t complain when I vented about my lack of sleep for the millionth time during the first few weeks after my baby was born. She also never got annoyed when I sent her photos of my son’s first smile, even though in retrospect, it was more of a strained smirk. Everyone knows Donna from “Parks and Recreation” has one catch phrase: “Treat Yourself.” When you were opening countless gifts of newborn clothes, Donna was the one who bought you a deep tissue massage at your favorite spa. When you were sick with the flu and your baby was keeping you up all night with a harrowing cough, Donna convinced you to hire a babysitter during the day so you could rest. Donna wants to take care of you. Let her. My Donna gave me a special care package when I was pregnant that contained all of the items that no one would ever think to get you, but that were immensely helpful post-delivery. Inside a filled-to-the-brim lululemon bag were disposable nursing pads, organic Lansinoh and Triple Paste. My Donna made feel prepared, and at ease even before the baby was born. She is an honorary member of your family, having known you throughout your awkward high school stage and your tumultuous relationships in college. She might not have kids of her own, but she knows you in a way that no one else will ever come close. This relationship might be the hardest to maintain over time, but it is worth the effort. Give her a call when the baby is napping. Ask her about the dates she’s been on recently, and take time to keep up with her latest work promotion. She will always be like a sister to you, and an aunt to your children. I remember feeling emotional as I glanced at my Childhood Bestie during my son’s bris. After all, she was in AP English with me, at my high school prom, my wedding, and my hospital recovery room. Having her at my firstborn’s bris was a special commemoration–not only of the event–but also of our life-long friendship. You may have been pregnant at the same time, and commiserated over cravings, weight gain, and registry lists. Or you may have met in a new moms group once the baby was born. Either way, she is in it knee-deep with you. She’s the one you can call up late at night to cry about your dwindling milk supply, your baby’s strange colored poop, or your physical exhaustion. She will also be as ecstatic as you when you introduce solid food, and when a tiny tooth breaks through for the first time. She gets it. She knows it. She is it. Indulge her as well. Listen to her issues and share war stories. Prevent any sense of competition by injecting a sense of humor at all times. Laugh hard with her. When my son first slept through the night, I proudly announced it in my new moms support class the following morning. Fellow moms lined up to give me hugs so tight that I was terrified milk might spurt out from under my blouse. They treated me as if I had just won the lottery. Because in our world, I just had. She is the one who has already gone through what you are currently experiencing. She tells you not to take everything so seriously. In the long run, whether your baby naps for 15 minutes or three hours, it probably won’t make a difference. She also has resources to share. She knows an excellent music class in the neighborhood, the best technique to NoseFrida your congested little one, and the toy that will keep your baby occupied for hours. When my son got a cold for the first time, I was scared. I knew that it was a minor illness, but he was having trouble breathing through his nose, which interfered with his sleeping and eating. My Older and Wiser One texted me simple messages throughout the day that all basically said, “This too is a phase that will pass.” She was sympathetic but also helped me see the bigger picture. I am grateful to have friends in my life who fulfill each category. As a recipient of these kind and generous relationships, I hope to one day be The Good Listener, The Donna, The Childhood Bestie, The Other New Mom, and The Older and Wiser One. I want to listen, take care of, and support other women who are navigating motherhood for the first time. I’d like to share what I’ve learned without being dogmatic. While searching for these characteristics in others, let’s also keep the cycle in motion by paying it forward, and being the types of friends that other moms need.